For Young Audiences of Houston (YAH), the goal has always been to increase the level of access that students have in the arts. Since their founding in 1956, they have been working to educate and inspire children through the arts, to make the arts an integral part of the school curriculum, and to advance the field of arts in education through teacher professional development training and community partnerships. Though YAH is already a large provider of equitable arts experiences - last year YAH provided high-quality and educationally sound programming for over 207,000 children in the greater Houston area - they were not content to stop there. There is still a widely pervasive need for greater access to the arts for students in the Houston Independent School District (HISD). In 2013, in an effort to evaluate the scale of that need and to come up with a plan for meeting it, Young Audiences of Houston partnered with HISD and the City of Houston to establish the Community Arts Team (CAT). The Community Arts Team is a 38 person committee which consists of business, philanthropic, civic, education, and arts leaders. The primary task of the Community Arts Team was to assess the landscape of arts education in HISD and decide upon the best course of action to provide equitable arts access for every HISD K-8 student based upon the results of the assessment. 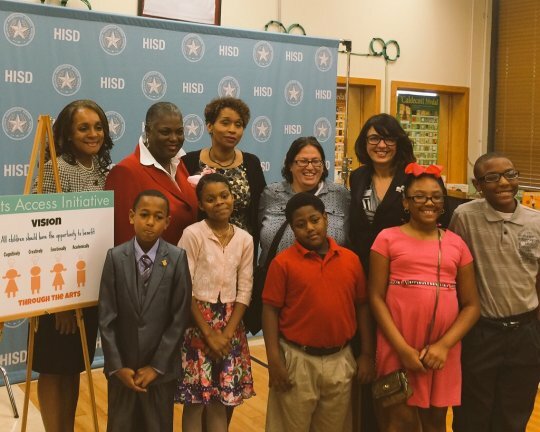 The initial planning and data gathering phase took more than a year to complete, with the CAT gathering and analyzing both qualitative and quantitative data from 208 individual HISD K-8 campuses. Through the analysis of this data, the Community Art Team found that there was indeed a "gap" in arts programming within the HISD. While some schools possessed a strong and enriching arts program, almost 1 third of the campuses involved in the study did not employ even a single full time, certified fine arts specialist, nearly 40% of students attended a school where only one or zero experiences from an arts organization were available annually, and nearly 30% of students lacked the opportunity to benefit from receiving out of school time arts learning experiences. 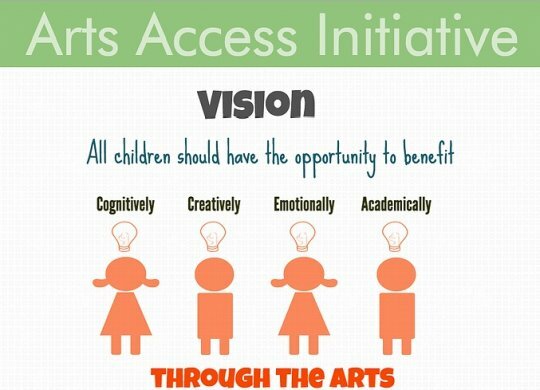 (State of the Arts Mirror Report 2013-14) The Community Arts Team's shocking findings prompted them to recommend the introduction of the Arts Access Initiative, an action plan to "bridge the gap", and to provide valuable arts experiences for all HISD K-8 students. Based on the findings of the Community Arts Team assessment, AAI designed the Creative Schools strategy which serves as the foundation of AAI's work and anchors the initiative as a major part of HISD's arts education expansion agenda. Through the partnerships fostered with many different arts and cultural organizations as well as key local and national funders, AAI is able to bring high quality arts experiences to the students of HISD. Data collection and advocacy are the last two key pieces of AAI's overall strategy. Data collection offers the opportunity to constantly measure the success of the initiative and allows for a mechanism of adapting the approach if necessary. Data collection also inherently supports advocacy, which is vital to the success of the AAI. In order to ensure that arts education is recognized as a vital part of the educational process, the AAI will use the data collected throughout the initiative to support advocacy efforts to influence policy decisions and to build a strong community of arts education supporters. The upcoming 2015-16 school year will mark the launch of in-school implementation for AAI. The pilot implementation year will include 11 schools throughout the district, encompassing over 7,000 K-8 students. During the course of the year, AAI will work to connect students and schools with YAH teaching artists as well as community arts partners in order to offer both in-school and out-of-school time arts programming. In order to support and ensure the success of AAI, upon agreeing to be a part of the Arts Access Initiative, schools also agree to a commitment to funding $10 per student, full participation of campus staff in at least six hours of arts integration professional development, as well the designation of an Arts Access Campus Coordinator to coordinate resources, distribute information, and monitor implementation and data reporting. The response leading up to the implementation of the 1st year of the Arts Access Initiative has been overwhelmingly positive. Dana Darden, the principal at Benbrook Elementary school told YAH that "as an elementary school principal, I am always searching for ways to expose our scholars to the arts. The new Arts Access Initiative will finally capture my vision for incorporating arts into the classroom...I truly believe that arts education sharpens critical and creative skills. Exposure to the arts teaches scholars to think openly, and to share and reflect on the arts as they learn something amazing about the world they live in." Douglas Stewart Torres-Edwards, the Innovative Specialist in the Innovative Curriculum and Instruction Department at HISD believes that the AAI is key to expanding HISD students learning beyond just what is 'on the test'.
" Houston deserves a new vision for schools—a vision that positions schools as places where all students can be fully human, not a vision that reduces schools to test-prep factories. Houston’s Arts Access Initiative is making that new vision a reality." The Arts Access Initiative is based on an initial plan of implementation and sustainability, where individual schools and their staff will go through a period of training, followed by the implementation of the initiative in the school, and finally a transition to a period where – after gaining experience implementing programs through the initiative - they can become “mentors” to other schools who are new to the initiative, or have yet to participate in AAI. Young Audiences of Houston and AAI hope that through the implementation of AAI, every child in the HISD will have access to high quality arts experiences.